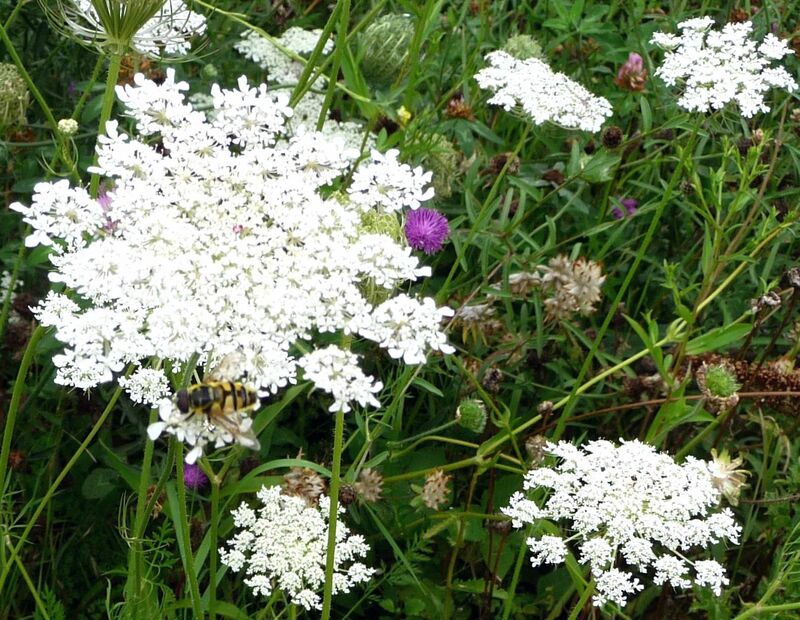 Wild Carrot grows in grassland, hedgerows, sandy soils, along roadsides & on cliffs. It flowers from June to August, each flowerhead a flat disc of tiny CREAM flowers with a single RED flower in the centre. After flowering, the disc begins to close; gradually it forms itself into a cup, ending up as a globe of dry brown seeds & stems, good for birds. One wild carrot, planted in our garden, was found good enough to eat – probably by mice. It regrew, but the new growth, too, was eaten & its stringy, unpalatable root dug up & eaten as well. 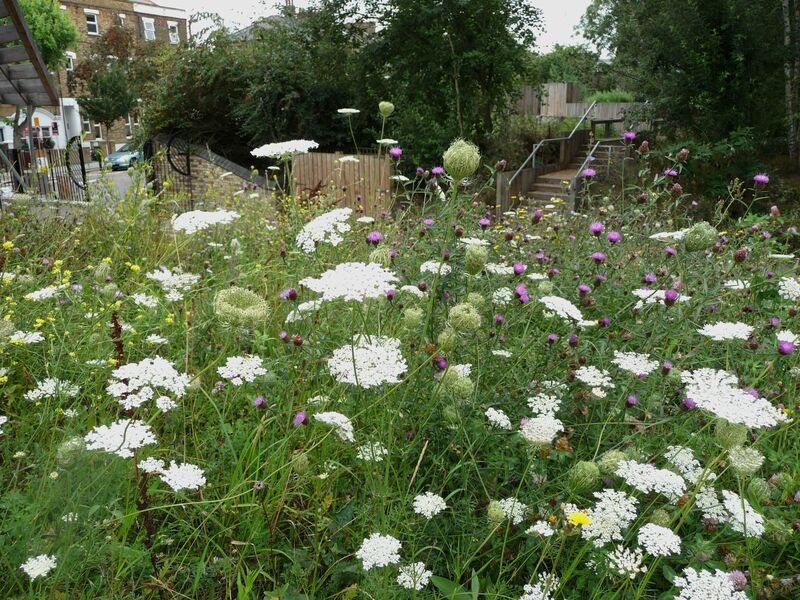 Horwood counted 61 species of insect known to visit Wild Carrot in Britain in 1919: bees, moths, beetles & bugs. British Wild Flowers in their Natural Haunts, A R Horwood, The Gresham Publishing Company, London 1919. 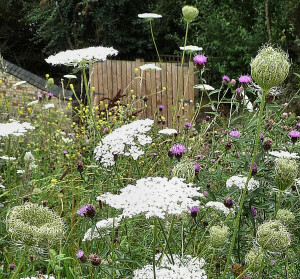 “Daucus carota can usually be seen growing in the Plant Family Beds and Student Vegetable Plots at Kew… More than 80 collections of Daucus carota seeds are held in Kew’s Millennium Seed Bank at Wakehurst in West Sussex. It is thought that the familiar orange carrot in cultivation today originated in the area around Afghanistan, Iran and Pakistan and had roots that were dark purple due to the presence of the pigment anthocyanin. Dark red and purple carrots are still grown in Afghanistan today. 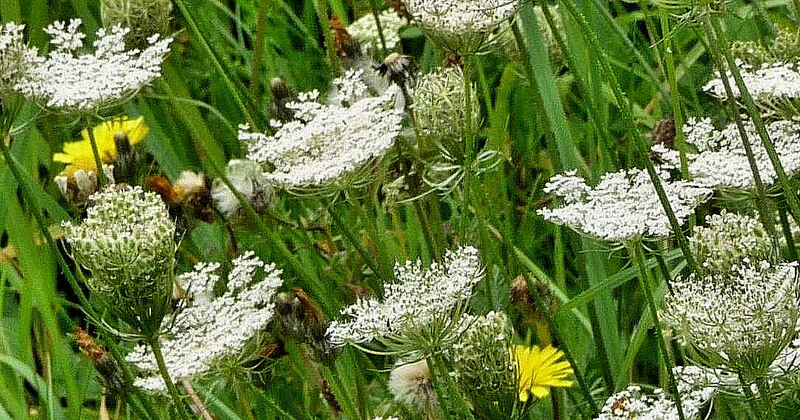 Other names: Bees-nest, Bird’s Nest Root, Bishop’s Lace, Carotte, Carotte Commune, Carotte Sauvage, Crow’s nest, Dauce Carotte, Daucus, Daucus Carota, Dawke, Devil’s Plague, Dill, Fiddle, Fool’s Parsley, Garden Carrot, Garijara, Herbe a dinde, Hill Poppy, Hill-trot, Kex, Lace Flower, Nan He Shi, Nid d’Oiseau, Rantipole, Shikha-Mula, Yarkuki, Zanahoria Silvestre. Wikipedia says the root of Wild Carrot contains much sugar. Brought to N. America as a dyer’s weed, it provided a creamy, off-white colour. Along with certain other plants introduced from one country to another, this one has made a nuisance of itself. The US Department of Agriculture calls it a noxious weed, a pest in pastures whose seeds persist in soil for 2 to 5 years. They advise wearing gloves when handling the leaves, which may cause dermatitis.